(Washington, D.C.--February 11, 2019) Kenneth R. Feinberg and Camille S. Biros, two noted victims’ compensation experts, have been named Administrators of a New Jersey state-wide Compensation Program – approved and supported by all five Roman Catholic Dioceses located in the state. Today they announced the creation of the Independent Victim Compensation Program (“IVCP”) to pay eligible victims who were sexually abused by clergy of the Roman Catholic Church while minors. The Catholic Church in New Jersey has committed substantial resources to prevent any abuse of any child at any time by any person. The Church has comprehensive policies in place both to respond to – and of far more importance - to prevent the sexual abuse of minors. The name of God and of humanity were desecrated today in Christchurch, New Zealand when people filled with hate violated the sacred precincts of two mosques and murdered 49 innocent people during prayer. We grieve with the bereaved families of the victims and their communities, and we condemn in the strongest terms possible these barbaric acts of premeditated violence and murder. Click to read full statement. 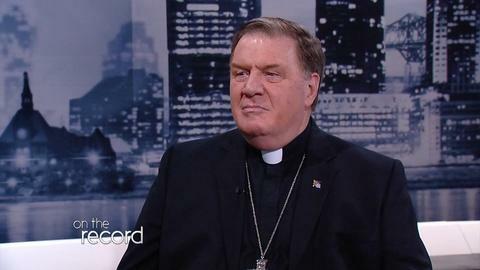 "On the Record with Michael Aron"
On May 5, 2018, Joseph Cardinal Tobin appeared on NJTV&apos;s "On the Record with Michael Aron." During this extensive interveiw Cardinal Tobin discussed his role as leader of the Archdiocese of Newark, his first imperssions of New Jersey, and the need for Catholics to advocate on behalf of the poor, immigrants, and the most vulnerable in society. Founded in 1949, the New Jersey Catholic Conference (NJCC) represents the Catholic Bishops of New Jersey on matters of public policy. NJCC serves as a liaison to governmental agencies and institutions and coordinates communications and activities between the Bishops and secular agencies. The Archbishop of Newark is the President of NJCC. There are more than 3.5 million Catholics registered in seven dioceses throughout New Jersey. The Catholic bishops of the United States are pleased to offer once again to the Catholic faithful Forming Consciences for Faithful Citizenship , our teaching document on the political responsibility of Catholics. Learn More .